1. In a large pot over medium heat, heat oil. Once hot, add onion and saute for 5 minutes until translucent. Sprinkle with salt. Stir in garlic, ginger, chile until fragrant, around 2 minutes more. 2. Stir in the red bell pepper, thyme, allspice, cinnamon, nutmeg, cloves, broth/water, coconut milk, chickpeas, bay leaf and carrots. Raise heat and bring to a boil. Reduce heat, cover and simmer for 5 minutes. 3. Stir in the plantains, and cook an additional 10 minutes, stirring occasionally. Add the lime juice, tamari, and green onion. Season to taste. Remove bay leaf prior to serving. Sometimes a cold wind could be worse, right? I feel your pain! I didn’t realize you guys were getting married so soon! A tropical wedding sounds really fantastic, and I bet it sounds even better to you guys (it is NOT that cold here, let’s just say). 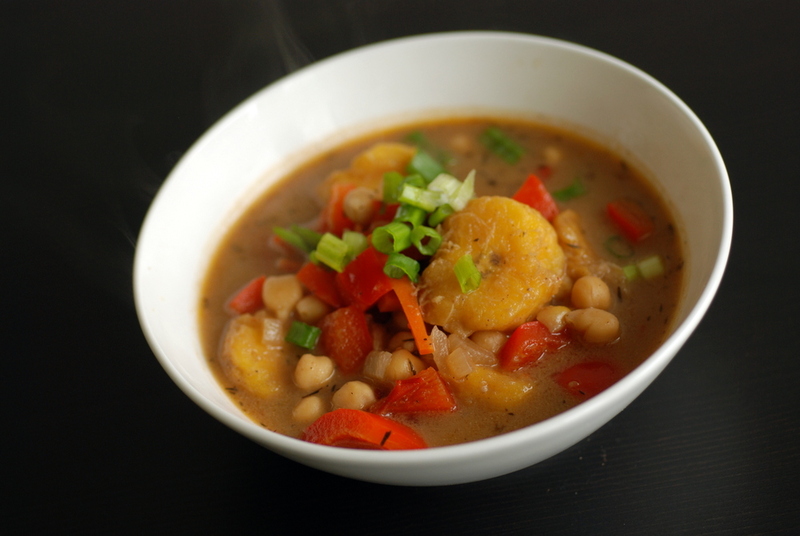 Spicy savory soup sounds like a perfect way to get warm and dream of the tropics! Its really really cold here also! I have been eating soup for Breakfast! Always wanted to try Plantains going to try this! Congrats getting married! Wonderful soup thanks-Will get down to the market and buy plantain asap! congratulations on your upcoming wedding, and happy new year:) I’m also looking forward to summer, but happy that spring with all the flowers is coming first! Soup sounds good. I will need to figure out whether to use bananas or give plantains another try (I don’t quite know what I didn’t like about them). Best wishes on the upcoming nuptials! Wow your wedding is SO SOON! I’m so excited for you! From what I am told, planning always seems like it will never get done, but somehow it always does. Make sure you are taking time for YOU as well! This soup looks amazing. I have been all about the plantains recently. looks yummy!! 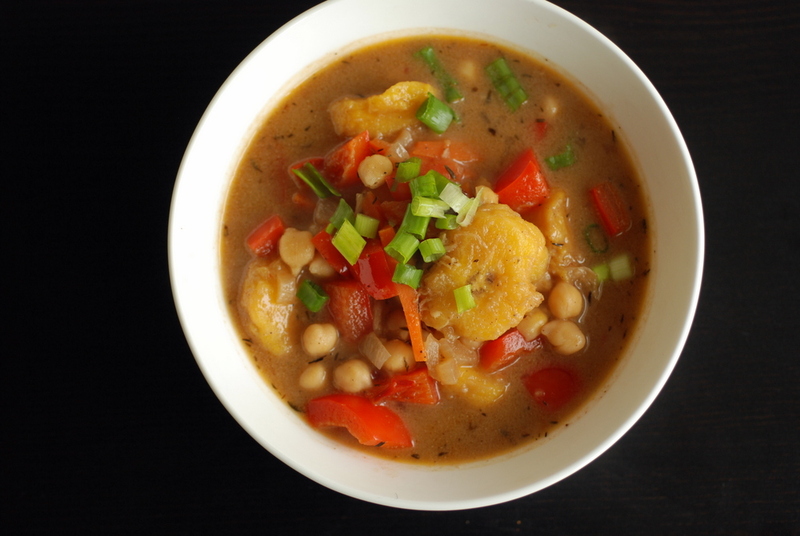 I’m always looking for ways to incorporate more Jamaican flavors and plantain into my diet. beautiful! Gracious me. I would love this. All of those flavors. Yum. Lucky you getting to escape the cold. Winter in Canada is simply dreadful but this dish would cheer me up for sure. Seriously looks good. Thank you for sharing with #vegetablePalette, the round up should be up tomorrow.